A wee bit cooler this morning but after a relatively good nights sleep (there were a few young babies in the group that created a big circle that blocked off our access to the kitchen) and they cried throughout the night and since echoing is big up here their cries were alot louder than normal! 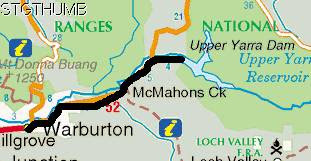 For me the ride back to Warburton would be easier than coming up here as we had eaten most of our food and so my food panniers which were 15kg coming up here from Bayswater were probably around 5kg now! On any trip the route seems to always be alot easier than getting there. In this case I would say it was alot more down hill than up hill returning back to Warburton. On our way up to Upper Yarra Reservoir we passed a car that was down an embankment and since I came across it and there was no glass or anything around it I thought that maybe it had just happened so I waited for Neil and Dad and Neil had a look and no one was in the car. I do remember the night before in the early evening there was sirens going to the direction of the Upper Yarra so we assumed this is where they were going to. There were a few skid marks so maybe the car was speeding down the hill and lost control and skidded off the road but managed to squeeze the car between an electricity pole and a tree shrub - lucky s/he didn't hit the pole as I think they may have come of worse than what they actually did. Anyway that happened when we stayed at Warburton on the first night and I forgot to put the camera card back in the camera so I couldn't take photos of it on the way up to the Upper Yarra Reservoir so I thought I would take photos on my way back but when I did remember on the way back I couldn't see the car from the other side of the road ... but Neil did see the car and knew where it was so he took these photos of it. We are also going to assume that the car will most probably stay there and not be retrieved - silly though as the number plates are still on it! We got to Warburton just on lunch and Neil convinced the manager to give us a designated camp site rather than just anywhere around the shelter. Lucky as when we passed the shelter there were huge tents and grouped that dominated the shelter and it would have been awful for us. So we had a great spot near the river. During the rest of the afternoon and night there were people coming in and setting up their campsite in preparation for Easter and then leaving to go to work (we presumed! ).